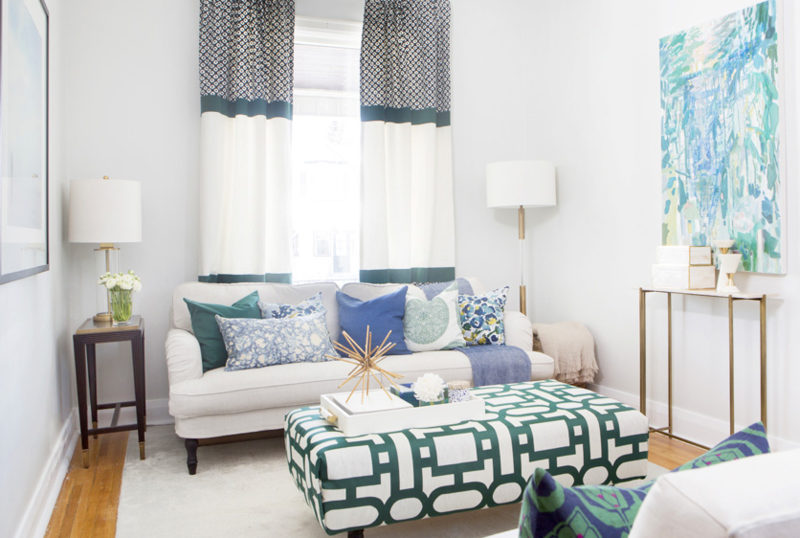 A small living room shouldn’t hold you back when it comes to decorating. You can still be creative in designing your room and showcasing your personality. Discover fun and innovative ways to make the most out of your living room and keep your guests amazed. With some extra planning you can convert your living room into a functional and gorgeous area to entertain or relax. If your space is limited, consider having a comfortable couch with a soft blanket and some ottomans and pillows to give the room a more enticing and peaceful feeling. Also, a small coffee table can add a warm feeling to the room and make it more engaging. In addition, a cozy rug can aid in giving it a soothing feeling. Your guests will focus more on the comfort of the room and not notice the size as much. White walls will make your living room feel substantially larger. In general, white offers a clean and refreshing look. By picking a neutral color your eyes will be fooled into thinking the space is much larger than it actually is. Avoid any darker colors such as brown and blue because they can emphasize the lack of space and make the room look even more cramped. Lighting is a key feature when it comes to decorating a room. Especially a living room, where people are more prone to socialize, it’s important to have adequate lighting. Avoid lighting that is too dim or overpowering. It’s best to have a nice balance of light so the room seems inviting and relaxing. You can be creative in the lighting fixtures that you choose. Try to pick lights that match the room’s mood. Comfortable furniture is necessary when designing your living room. Pick pieces of furniture that will go well with the rest of the room and are ideal for socialization. It’s wise to plan out the furniture you desire for your living room before buying it and make sure it meets the size requirements. If you have furniture that’s very large or bulky it will end up hurting the overall appearance of your room. For example, it’s better to have two smaller couches or a few cozy ottomans than one large couch because it will actually make your living room seem smaller. Also, ensure that the furniture doesn’t interfere with people’s walking. Allow natural light to enter into the living room to give it a warmer and more energetic feeling. By having a nice wall of windows in your living room you can easily let the sun shine in and make your living room appear larger than it is. If your space doesn’t allow for several windows you can add a mirror to your living room so it reflects the natural light. By having your furniture a distance from the walls it will give the impression that you have more space than you actually have. People will focus more on the cozy furniture and not realize the actual size of the living room. For example, placing your couch a few feet from your wall can easily give the room more dimension. Consider having bold and trendy pieces of artwork on your walls to keep people engaged and less focused on the size of the room. Also, the artwork can be deceiving and add more space to your living room. A cluttered and unorderly room will look much smaller than a neat and organized space. Add some bookshelves and cabinets to your room if space permits or find little pieces of furniture than can effectively hold books and any other items that can take away from the look of your room. By keeping the room open and uncluttered you will add more space to your living room and make it more inviting. Some couches come with little areas underneath to store small items. When looking for seating, it’s wise to pick a sofa that has an L shape since it gives the impression you have more room than you actually have. Also, this type of seating is great for entertaining since people can easily interact with one another. Don’t forget to add your own personality and sense of style into your living room. Just because you have a limited amount of room doesn’t mean you can’t include items in the room that are personal to you or display who you are as a person. By hanging a few photos of you and some friends or family and including artwork or a few knick knacks your living room will quickly come to life and be a wonderful place to entertain.